I have just finished and released a video which tries to explain the origins and meaning of the riots in Greece. It’s far from perfect, but between a severe three-day headache, an unhappy cat and Pinnacle Studio bisbehaving, it’s the best I can currently do. And that’s OK – the point is to give people who don’t know much about Greece an idea as to what the riots are about, and to do a tiny bit to fight against the misinformation spread by people who really have no clue as to what they’re talking about. I’ve had to upload the video in two parts, since it was slightly too long for YouTube. I’ll put up a full downloadable version soon (and edit this post to reflect that). If you find the video even remotely interesting, I’d like for once to urge you to give it a good rating and tell others about it. I’ve never really asked people to do this kind of thing for my games, because it would feel cheap – but this isn’t about my artistic output (or about me in any sense), it’s about this historical event whose cause and meaning are being presented in a rather distorted manner by the media. I know the video won’t make a huge difference, but if it can reach a few people, then that’s worth something. 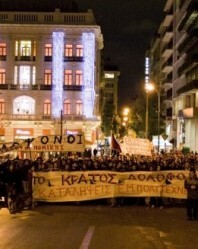 Watch The Greek Riots: Some Basic Facts (Part One) on YouTube. Watch The Greek Riots: Some Basic Facts (Part Two) on YouTube. Watch the embedded versions on the video’s page here. A small additional comment: I am fully aware that the protests are going to dissipate, and are already doing so. That does not alter their origins or significance. Previous PostThey’re not children! They’re terrorists!